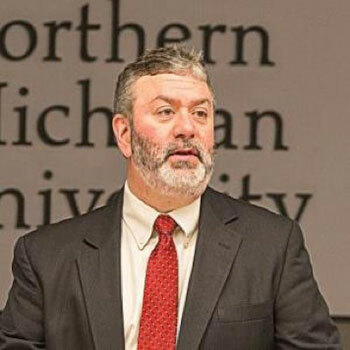 Dr. Brian D. Cherry teaches courses in state and local government, the politics of education, and public administration. Cherry’s research focus is on local government management and higher education. His recent works have appeared in the Journal of Public Affairs and State and Local Government Review. Cherry has served as Assistant Provost for Graduate Education and Research, Head of the Department of Political Science, and Director of the Master of Public Administration program, and co-founded the Center for Rural Economic and Community Development. He was elected to the Marquette Area Public Schools Board in 2010 and served for four years, and was re-elected to the board in 2016. Cherry holds an MPA and Ph.D. from Indiana State University, and a bachelor’s degree in political science from the University of Southern Indiana.